Solvent free adhesive and sealing product with zero shrinkage and high resistance to alkalis, acids, frost and moisture. Offers exceptional adhesion to concrete and steel. Once cured, it develops unique strengths against compression, flexion and detachment. 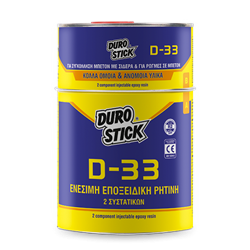 Suitable for repairing cracks on columns and walls made of concrete using the resin injection method. Also suitable for implanting rebars in stuctural elements. Apply it easily using the professional cartridge and ‘sausage’ barrel gun DUROSEAL 600 of DUROSTICK, along with the appropriate nozzles. Classified as concrete injection product per EN 1504-5 and class R2 per EN 12004. Crack sealing: 1.1kg for filling volume of 1lt.